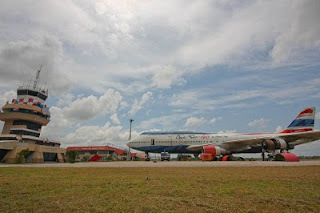 A catching sight at Udon Thani International* Airport is an old One-Two-Go Boeing 747 owned by Orient Thai airlines. The Jumbo is 26 years old now and has two engines left and is rumoured to be yours for just 5,000,000 Bath (€120,000/$155,000). As of September 2008 One-Two-Go stopped flying leaving a fleet of 16 planes, four of which were sold or finished the leasing contract, another four 747′s and six DC-9′s remaining on the ground for two years now, part of them with the engines removed. 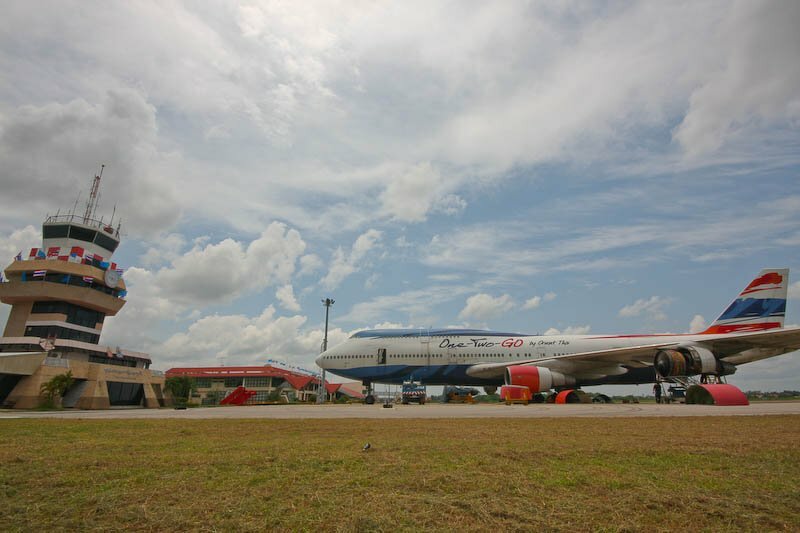 Status 2009: Moved from Don Muang to Udon Thani on 14 August 2009. Hiring airport space in Udon is cheaper than in Bangkok i.e. : 600 Bath/day (€14.50 /$18.50) in Udon as opposed to 2000 Bath/day (€48/$62) in Bangkok. In the week after two engines were removed. Photo dd. August 2009 by Flatlander. Photo dd. 20 August 2009 by Lee. Status 2010: On top the One-Two-Go colors and logo have been covered with adhesive foil, else it probably would give the owners a bad name. Photo dd. 16 July 2010 by I-nomad. The plane has been stationary for two years now, so why not turn it into a home or a hotel, like in Stockholm? * Although Udon Thani airport was intensely used for bombing Vietnam in the 70′s by the US, currently the sole scheduled international flight from/to Udon Thani is operated by Lao Airlines to Luang Prabang several times a week. I want to put that airplane in my yard!